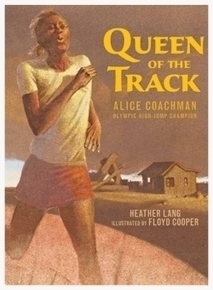 When Alice Coachman was a girl, most white people wouldn't even shake her hand. Yet when the King of England placed an Olympic medal around her neck, he extended his hand to Alice in congratulations. Standing on a podium in London's Wembley Stadium, Alice was a long way from the fields of Georgia where she ran barefoot as a child. With a record-breaking leap, she had become the first African-American woman to win an Olympic gold medal. Here is the inspiring story of an athlete who never took her eyes off the prize. Floyd Cooper is the award-winning illustrator of more than 75 books for children. You can visit him at floydcooper.com. *The author's royalties will be donated to the Alice Coachman Foundation, which helps deserving and proven amateur athletes reach their full potential. "It's my wish that every young person read this inspiring book. Alice Coachman is truly a hero and her accomplishments remind us all to never give up when the odds are against us." "Lang's descriptive text and Cooper's signature sepia-tone oil illustrations offer a rich, deep depiction of Coachman's determination to overcome obstacles." "[T]his biography stands out for the lesser-known details it includes . . . Cooper's grainy sepia-hued pastels are striking; endnotes with more about Coachman and the historic 1948 Olympics support the thorough text." "Lang has done her homework on Coachman." "[A]ccessible enough to appeal to new readers, and detailed enough to jump-start students looking for an excellent candidate for a National History Day project."